Formerly Life Extension Natural Estrogen, Estrogen for Women is a unique, plant-based formula designed to reduce symptoms of menopause and support healthy estrogen metabolism. It delivers soy isoflavones, calcium, and potent botanicals like concentrated hops extract, broccoli, licorice, and chasteberry extracts, dong quai, and more. Now just a single daily tablet. Get menopause symptom relief with Estrogen for Women. Other ingredients: microcrystalline cellulose, stearic acid, croscarmellose sodium, maltodextrin, vegetable stearate, silica, aqueous film coating (purified water, hydroxypropyl methylcellulose, glycerin). Novasoy® is a registered trademark of Archer Daniels Midland Company. HMRlignan™ is a trademark used under sublicense from Linnea S.A.
Estro8PN® is a registered trademark of Berg Imports, LLC. Dosage and Use: Take one (1) tablet in the morning, with or without food, or as recommended by your healthcare practitioner. Estrogen for Women should be taken cyclically: three weeks on and one week off, beginning on the 5th day of the menstrual cycle for premenopausal women, and every day for postmenopausal women. Those taking any estrogenic product should include as part of their diet cruciferous vegetables such as broccoli, Brussels sprouts, cabbage, and/or cauliflower. 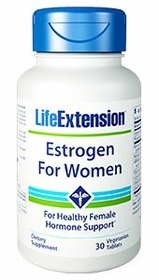 Women should also use a progesterone cream when taking this product. Caution: Do not take in case of pregnancy, lactation, or estrogen-dependent tumors.